Week 20 update and elliptical? P90X leg workout. Added light dumbbells and went well. My PT said I am not lifting my toe enough when I walk. Added walking on my toes and heels to my normal home routine. I was able to do 4 reps single leg toe raises. Pt said to forget about it and focus on activities where I can do 20+ reps. I.e. double toe raises and shift weight to injured side as much as possible. Put up Xmas lights. A lot of up and down on the ladder and standing on a slanted roof. Most challenging part of the week. Anyway I hope that helps others gauge their progress. Looking forward I am thinking of investing in an Elliptical at home for the low-impact benefit. Any recommendations out there on a good brand/model? 14 weeks and suddenly ankle swelling? Was feeling good about my progress and suddenly a week ago I started getting swelling around my ankle. I have been lucky up until now to not have much swelling at all. No significant pain. Still doing PT but have pulled back on really getting after it. Anyone else have this experience at this point in their recovery? Finally out of the boot! Started PT-alphabet, circles, resistance bands and balancing on one leg. Not as bad as I thought. I can walk almost without a limp right after PT with shoes on. Big thing is very little power on the injured right leg but I know it will come. Dr green-lighted resistance exercises but no explosive movement for 6 more weeks. He said weights actually help lengthen the tendon which is important as we age. Looking forward to getting back to lower body work. Wishing all you posters well! Went and saw the Dr today and good news/bad news. I’m cleared for FWB but will need to wear the boot for another 6 weeks and no PT yet. He said the delay was due to a degenerative condition in the Achilles before repair and it needs more healing time than it would otherwise. The atrophy in my calf is pretty startling to say the least. With that said, I forgot how it easy it was to do things when you can put two feeton the ground. So at least there’s that. I’m really impressed with the positive energy that everyone has on this page. Good luck on your recoveries! Hello All, This is my second go-around with ATR. My original injury happened on my left leg while I was playing basketball 22 years ago. At the time I thought I was tripped from behind, but have others have said no one was there. I distinctly remember NOT having any plantar flex in my foot which is I thought was standard with this injury and leads my gap in treatment the 2nd time around. On June 9th I participated in the Warrior Dash. I hurt my right leg on the first obstacle which was a little salt in the wound. My daughter who was hesitant to participate at all finished and had a great time while I was in the medical tent. 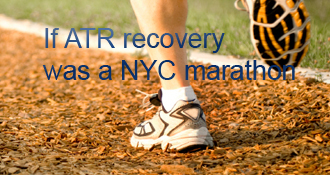 My initial fear was ATR, followed by calf strain as I still had movement in my foot. Only after a month of self-rehab and a visit to the PT that I got the bad news that my first concern was the right one. My surgery was on July 10th. Surgeon told my wife that there was some previous damage there and a tear was inevitable. Also said the tendon was “tight” and I will really have to baby it initially. I was in a splint for two weeks and then an air cast. Still NWB until at least August 17th. The PA says the protocol is to go right to shoes and FWB. Should be interesting. I have been doing upper body work and even crutch around the neighborhood for exercise. This helps physically and to keep my spirits up. I have been eating a lot better than I have in a long time due to fear of gaining a bunch of weight. I’m hoping this will help me overcome the 10 pounds I have been trying to lose for years. It has really helped me by reading about others’ experiences on this site. Real challenge is to remain patient knowing there is such a long road ahead. Great post. It’s very helpful for me. Hey Junebug! Hope you had a good Thanksgiving. I walk normal, no limp at all. It’s been that way for about 4 weeks. After my first few attempts at distance walking swelling was pretty significant and I had to elevate when I was home. The swelling has gone down a lot the past couple of weeks and I can walk at a pretty brisk pace. I have a dog too and he helps get me out the door. Great progress Jeff! I’m really looking forward to being able to do something like a 2.6 mile walk outside…my dog is sorely missing it! So you’re at what, the 5 month mark? I’m curious if you are still limping at all or walking fairly normal now. Also, after your walk, what’s the status of the achilles? Is it aching or complaining at that point? Just trying to get a reference for the future. Thanks CSerpent. Helpful as always! Thanks CSerpent. I can already see why a frustrating stage for many. The calf is so weak seems like will never be able to do single leg calf raises. I’ll keep at it consistently though. Looks like your on a more aggressive schedule than I am. Good luck on your transition out of the boot. Congrats! I know what a relief that is. I get to transition into shoes (with a heel lift) next week! I’m doing some basic PT at home already - alphabet, forward/backward, circles, light resistance band work - and that’s all I get to do until week 10 when I start “official” PT. I’ll be at 7 weeks on Wed. I’ll still be booted part of the time until week 11. My doc has me transition into shoes slowly - 1/2 time in shoes at week 9, 3/4 time in shoes week 10, full time in shoes week 11 - as tolerated of course. I had the needle like pain initially as well on my right foot when I started walking in the boot. From what I remember it only lasted the first day, but my doc had me slowly work up to walking. So I could walk 25% of the time in the boot during the 1st week, then 50% of the time the next week and then 100% of the time the following week if my foot was OK with it. Sorry to hear that. I had some sharp pain in my heel initially. Like needles. That subsided after about a day. If you check Agnes’s blog she had a pretty deliberate approach going from PWB to FWB. Hope you get past this hurdle soon. 6 weeks post rupture surgery here and was excited to receive the ok to start weight bearing in my walking boot. I expected some weakness and discomfort but didn’t anticipate this amount of pain throughout my foot but mainly sharp pain in my heel. Three days later it hasn’t let up and I still depend on both crutches to get around. Has anyone else had this experience? How long should I expect this to last? @yankeefan. So you were smarter than me and got this taken care of right away :). Shoes are definitely something to look forward to. Hope your calf keeps strengthening. @cserpent, thanks for the reply. The tone of your messages having gone through this kind of thing twice is just taking it all in stride. Good for you, many others would get frustrated. Hope you heal up quickly to get back to it! @Chris Met directly with the surgeon last and he basically said PWB until you feel good about FWB. He never incorporated lifts so I’m at 90%. Two days into it and I can walk with just the boot no problem though I’m using the crutch most of the time just to play it safe. With that said my foot swelled up last night which I attribute to the new experience. Nice job keeping up with the workouts! You’ll have some good mo’ when you can incorporate the legs. Hope all goes as planned on the 22nd. For my haglunds surgery my path to walking was similar. My doc knew I wanted to play soccer again so he wanted to make sure everything was healed around the anchors before I went into shoes. My path differed slightly in that I was FWB in boot from week 6-8, then 25% of time in shoes (with a heel lift), 75% of time in boot for another 2 weeks, then 50/50 for another 2 weeks and finally full time in shoes with a heel lift. And, yes, the calf atrophy is kind of amazing! And now I’m in the first week of recovery after the same surgery on my left foot I know how good my right foot felt in the end so I was looking forward to surgery on my left foot! Hey Jeff, I also ruptured mine on June 9th but had the surgery a few days later on the 13th. I just transitioned to 2 shoes on Friday 8/10 officially, though I had been trying out some walking on my own before clearance from the MD. I’m walking with a limp but it’s getting easier and less noticeable (hopefully). Tendon feels super stiff and double leg heel raises hurt from the stiffness, but it’s feeling better every day. Thanks for sharing, it’s good to read from others in a similar situation! Jeff, our situation mirrors each other by just a couple days. Around Aug 22nd I will go to PT with PWB. Keep us posted on how the FWB goes. Sounds like your protocol is a little more aggressive than mine, and you will be mobile fairly quickly. It’s been nice doing an upper body workout to include push-ups, sit ups, and trying to fight the battle of the bulge. My wife has been feeding smoothies to me every morning, and that’s been helpful. Thanks for sharing, keep us posted. jeff16’s AchillesBlog is proudly powered by WordPress and WPDesigner..